LOUISVILLE, KY (KTRK) -- A mother in Kentucky says she tried to punish her son by making him mow lawns for free. But it backfired, and he enjoyed it. It was Barbara Wilson's discipline plan for her son, Travis Durham. She told him to cut a couple of their neighbors' yards, but when she got home, he had cut eight yards. Wilson said, "He loves doing it." Travis wanted to continue -- and he got his two brothers and a cousin on-board. Travis told station WDRB, "We doing it for the community, people who can't get out and do it. And I got my brothers involved cause I kind of showed them and told them the good effects." At 14 and 15 years old, they're going door to door, spreading the news about their work. Wilson said, "Because they're young black males, people are a little afraid to open their door. They just shut the door, 'no thank you.' They don't even give them a chance to tell them it's free we want to stay out of trouble, we just want to take care of our community." They've worked in several neighborhoods, but it has taken a toll on their gear. 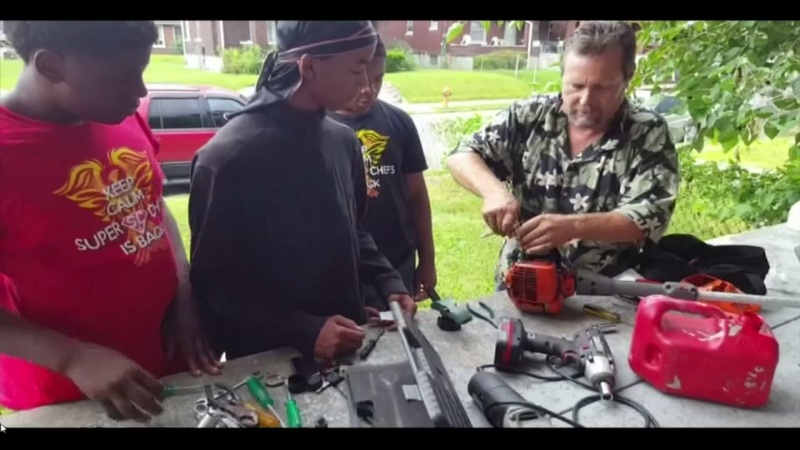 A man stepped up to show them how to maintain their tools. In two months, they've cut countless yards. The teens do not accept money, but they do accept equipment, and donations on GoFundMe. Travis' mom has promised a trip to Disney next summer. Wilson said, "It was a big deal for them, it got them motivated. I told them regardless, if they make enough money or not me and my husband we'll find a way." So far, they've made about $1,500. Wilson said, "It makes me feel blessed. I'm proud don't get me wrong. I'm blessed. There are so many kids out here that are so materialistic. They would not do this work for free." You can find them on their Facebook page called, "It Takes a Village, Together We Stand Strong." Click here for their GoFundMe page.